1. 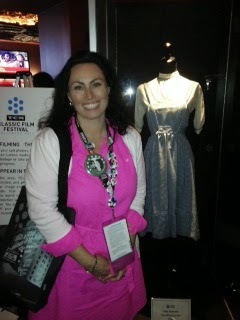 This was my very first trip to Hollywood (and for a lifelong classic film fan this is a BIG deal!) Specifically, this was my VERY FIRST TCM Film Festival! 2. In actuality, this was my first trip by myself, for myself. Oh sure, I’ve traveled by myself loads of times, on business. But this was my very first vacation without kids (yes I have four teenagers), without the hubby, and without any agenda other than unadulterated cinematic fun. 4. Speaking of amazing TCM hosts… Ben Mankewitz and Ileana Douglas. That’s right, I DID get to experience meeting Ben and Ileana -both charming and fabulous and both Hollywood ancestral legends in their own time. 5. 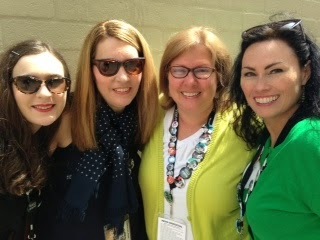 TCMFF Tweetup. 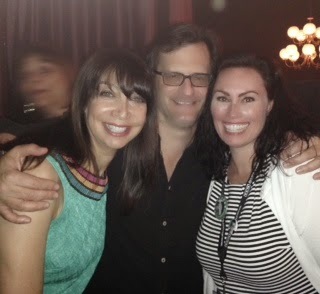 This took place the evening prior to the opening day at a modern speakeasy, “Sadie’s.” I was lucky enough (or rather chatty enough) to be included in the TCMFF Social Crew. 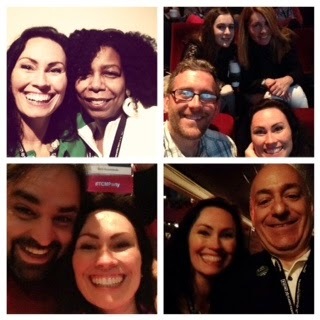 Meeting all the fellow tweetaholics was a treat because I already knew most of them via twitterverse! 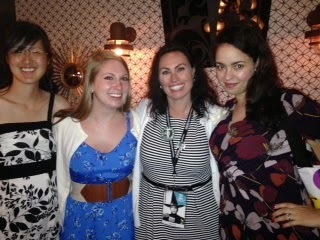 Lindsay @angelnumber25, Jessica @HollywoodComet and Raquel @QuelleLove… these cinematic beauties made me feel young again! 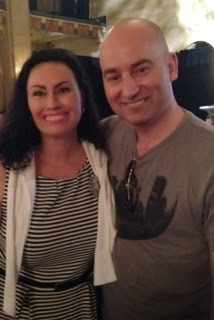 Laura of @LaurasMiscMovies and TCM’s Scott McGee… some of the nicest folks you’ll ever meet! CINEMA SISTERS! Hanging with Aurora aka @citizenscreen at the Egyptian. 6. 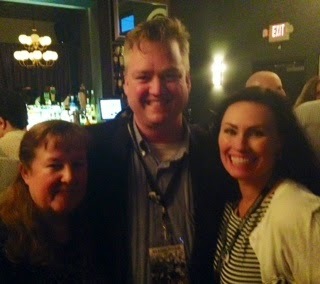 Meeting my #TCM and #TCMparty friends– IN PERSON! I was both excited and nervous leading up to the moments of meeting these ‘modern pen pals.’ As a friendly Midwestern type, I was worried my overzealous persona may be off-putting up close. 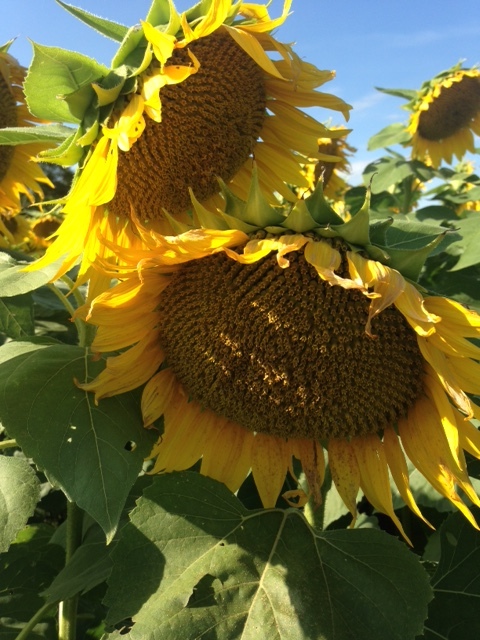 Happily, or so it seemed, my worries proved to be unwarranted. I immediately felt at home with my #TCMparty pals. Within minutes, it’s as though we had all known each other for decades. Like a family reunion; picking up where we left off. 7. The FORMOSA CAFE – after the Tweetup many of us headed over to this historic establishment. I had heard of the many stories from the Golden Age of Hollywood that took place at this cozy venue. I couldn’t have been any more thrilled to socialize with my chums in the same space as where stars like Bogie, Gable and Sinatra dined. 8. 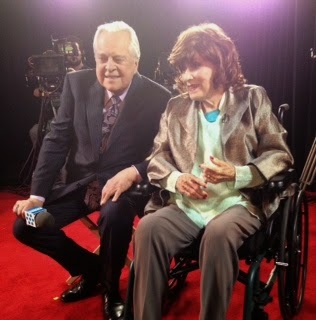 TCMFF Red Carpet. Okay, so I didn’t actually attend this event. I merely peeked at all the glamorous celebrities as I walked across the street. But what I did see from curious passing and from my friends’ photo sharings that positioned a closer view, it was a glorious spectacle. Perhaps next year I’ll work out the timing to claim a spot on the bleachers. 9. 5th AVENUE GIRL (1939) on the big screen. While I’ve seen this film a couple of times before, this screening was special. This was my first viewing on the big screen and my first screening at TCM Film Festival. Somehow Ginger Rogers conveyed an extra dose of sardonic charm this time. 10. BACHELOR MOTHER (1939) on the big screen. A Ginger Rogers double feature?! How can a gal be so lucky on the initial day of this wondrous fest?! 11. 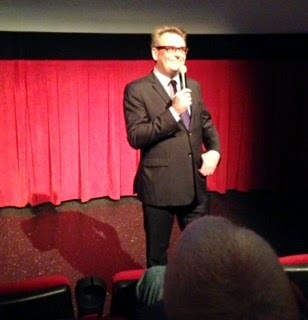 Comedian Greg Proops introduction to BACHELOR MOTHER. 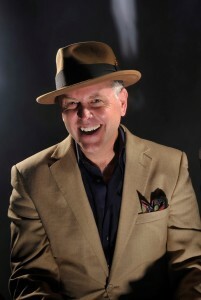 This veteran comic was a pro… sharp, witty, and fast-paced. Besides being very funny, I was also impressed by his mastery of detail on this film and the background stories. Yet this celeb of comedy was also just like us- a passionate fan. 12. Bumping into actor James Karen and his wife, Alba Francesca. I have chatted casually with Jim Karen during my attendance at the last two year’s of the Buster Keaton Celebration in Iola, Kansas. So when I stumbled upon this couple while rushing into a screening, I will so thrilled to see their familiar faces that I bowled them both over with exuberant hugs, immediately followed by my apologies for my bold familiarity. I reminded them of our chats at the Buster Keaton Celebration (like we were just the oldest of Kansas pals) and the two were kind enough to state they distinctly remembered me. I doubt they actually did, but I appreciated their kindness for my benefit. 13. Waking up to THE THIN MAN (1934). On Friday morning at 9am, I enjoyed a screening of this favorite classic while exchanging gasps of delight at Myrna Loy’s exquisite fashions and chuckles with Kimberly of @GlamAmor, Aurora of @CitizenScreen and Lara of @backlotsfilm. 14. 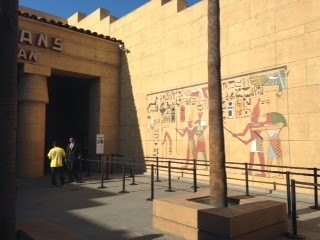 The famed EGYPTIAN THEATRE. Screening THE THIN MAN was my initial visit to this restored 1922 movie showcase. What a fun example of ancient Egyptian themed architecture. 15. TOUCH OF EVIL (1958). Introduced by Charleton Heston’s son, producer and director Fraser Heston, we were treated with a BEAUTIFULLY restored version of this film noir classic. The imagery was breathtaking. You could see every dirty bead of sweat on Orson Welle’s bloated face and I couldn’t have been more thrilled. 16. Buttons. So many fun buttons! 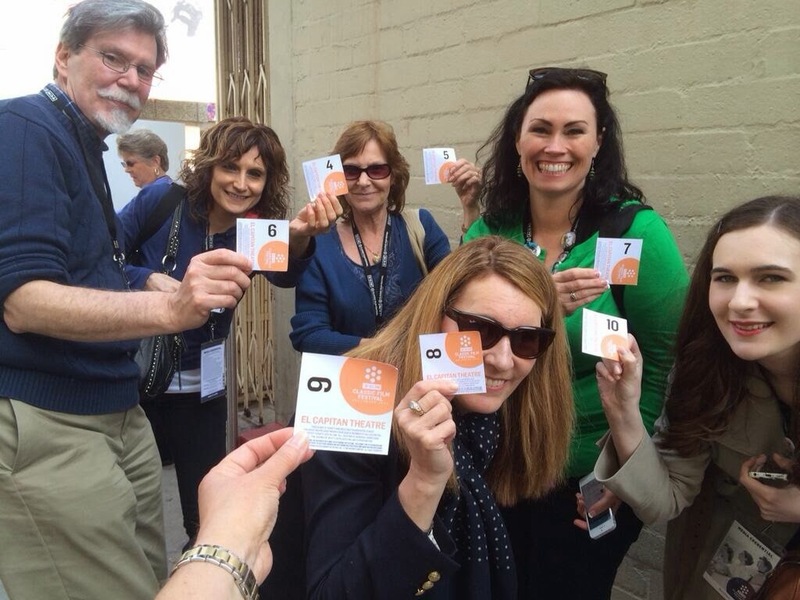 The good folks at TCMFF conceived this brilliant idea to reward us with a variety of social media buttons, with the ability to earn each unique button via a different social media experience. I really commend the folks at TCM for creating outstanding design work for this year’s festival. I chatted with a gal named Katie as we waited for the crosswalk light one early morning. 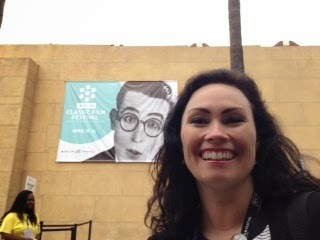 I noticed her TCMFF lanyard and initiated a conversation on how much I admired the design work on the many banners displayed. It turns out she not only works for TCM but was responsible for those designs. Great job! 17. More buttons! Additionally, we met a gentleman, Mark (aka ‘the button guy’) who created and brought an inventory of his own buttons, many representing the various featured films from this year’s cinematic line-up. He was an all around sweet guy and generous with his buttons- happily giving these away to any and all who asked. 18. The BEST button of them all. 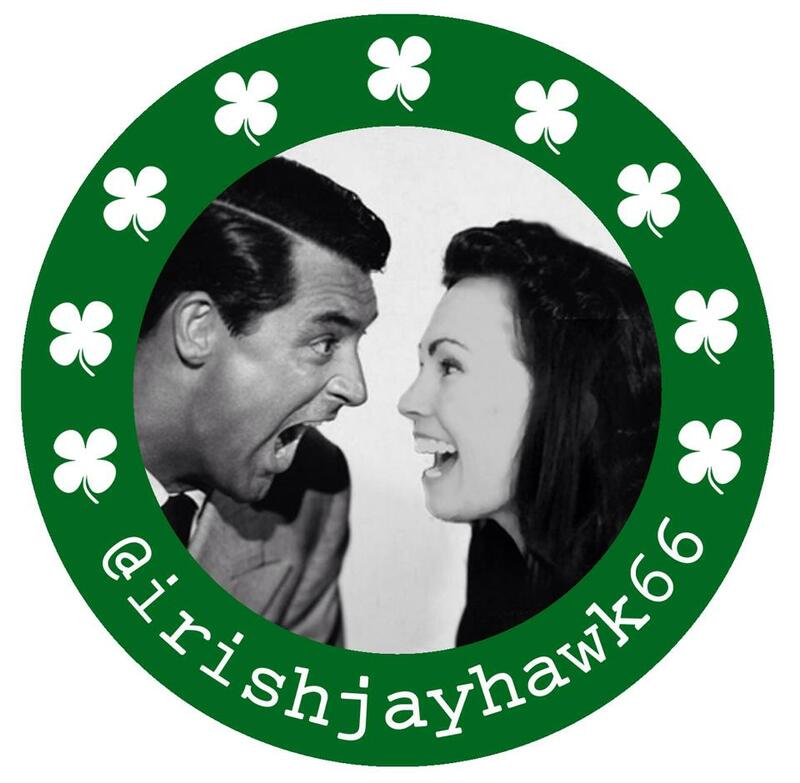 Speaking of fun buttons, my hubby created a magnificent button of my own to wear at the TCMFF. It represents my love of classic film and specifically Cary Grant, plus it states my twitter handle for the pragmatic purpose of identifying me via my twitter presence. He did a heck of a job with it because I received countless comments of praise. Well done, honey! 19. Margaret O’Brien introducing MEET ME IN ST. LOUIS (1944). I had heard that this legendary child star of the silver screen, now 77 years old and as energetic as ever, was seen sporting blue hair and nose ring on the Red Carpet the night prior. (How cool is that?!) Engaging us with witty anecdotes, Ms. O’Brien hadn’t lost her touch to capture our attention. And the film itself? The experience can only be described as a joyful toe-tapping, technicolor dream with a tear or two shed by yours truly. 20. Shaking Margaret O’Brien’s hand. While ordering a quick bite as carry-out, we spotted Ms. O’Brien in the Roosevelt diner, the “25 Degrees” restaurant. Trying to keep our wits about us, Aurora of @citizenscreen and I made the decision to act swiftly and introduce ourselves. Upon gently and respectfully taking her hand, she politely returned a greeting then turned to her seated companion and asked us if “we had met Judy Garland’s son.” Gobsmacked, we smiled and shook his hand as well. 21. The GRAUMAN’S CHINESE THEATER. Yeah, I know it’s actually called TCL Chinese Theatre Imax. But hey, it will always be Grauman’s to me. This jewel of a movie house was amazing. And while I heard its recent restoration eliminated more than 200 seats, the seating was very comfortable and the architectural details remain astounding. 22. Mel Brooks introducing BLAZING SADDLES (1974). This was my #1 pick of all the anticipated screenings. I’m a huge Mel Brooks fan and the very thought of seeing this hilarious comedy classic, up on the big screen, introduced directly by Brooks himself, at the very same theater (Grauman’s) that is featured in this film… well, it was almost too surreal to process. As anticipated, I laughed myself silly. 24. Patton Oswalt, introducing a midnight screening of ERASERHEAD (1977). Oswalt was a riot. I loved hanging with my #TCMparty friends as we got punchy from the long day. I had never seen this David Lynch cult classic so I wasn’t sure what to expect. But I can honestly say it was the strangest, most bizarre film I’ve ever seen with no redeeming qualities to speak of. To each their own though. 25. An enormous serving of a ‘laughter breakfast’ with CITY LIGHTS (1931). That Saturday morning, a group of us #TCMparty peeps (including Joel of @joelrwilliams1, Kay of @KayStarStyle and Aurora of @citizenscreen) laughed until we cried while taking in this silent classic. If you’ve never seen this film, and especially if you ever are in need of a ‘pick me up’, I encourage you to see it pronto. 26. Shaking hands with actor Jason Lee. Lee introduced the screening of CITY LIGHTS as a passionate fan of this iconic classic and of the genius behind it, Charlie Chaplin. Afterwards as we filed out of the theater, I stole a quick moment to shake his hand, thanking him for his heart-felt intro. I’m a huge fan of Chaplin’s masterpiece, too. Jason Lee came across as a very genuine and down-to-earth in person. Later that day as many of us took turns posing for silly pics in the TCM photo booth, I saw Lee with what appeared to be his entire family doing the same. Fun to see a whole family get involved in this classic film experience. 27. Another opportunity to see silent films on the big screen. I am spoiled in my home state with more than a few opportunities to see silent films in the way they were meant to be seen- on the big screen, with an engaged audience surrounding you. While CITY LIGHTS did not have a live musical accompaniment, there were a couple more choices to see a grand silent. Harold Lloyd’s supersized fun silent WHY WORRY? (1923) was introduced with a new score by maestro Carl Davis and granddaughter Suzanne Lloyd. Additionally, Hitchcock’s early chiller THE LODGER (1927) was screened the way a silent REALLY should be seen, in tandem with the live performance of the Mont Alto Motion Picture Orchestra. 28. Eggs Benedict at the 25 Degrees restaurant. This diner housed at the front entrance of the Roosevelt hotel is a relatively speedy and yummy option for grabbing nourishment on the run between events. 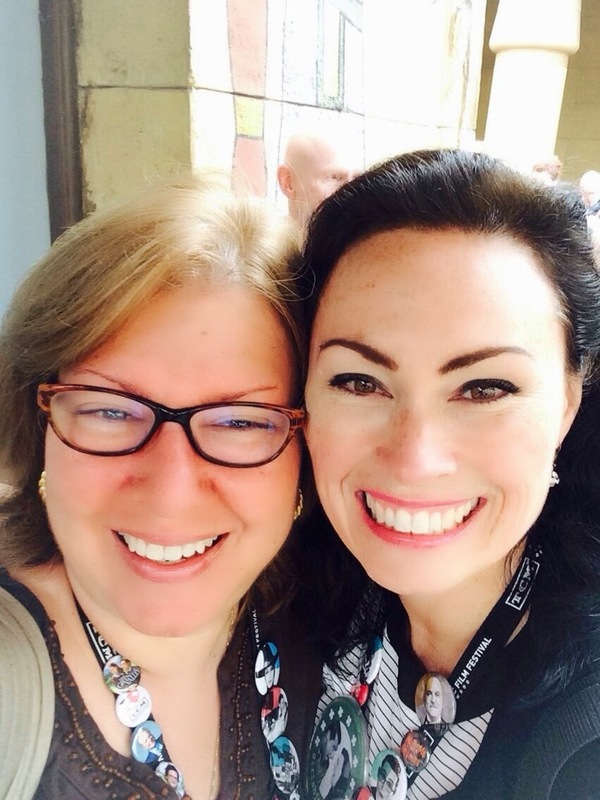 And you’re almost guaranteed to bump into fellow TCMFF pals and celebrities, too. Personally, I recommend the eggs benedict or turkey burger. 29. Often standing in long lines. I realize this would normally be a negative thing. But at the TCM Film Festival, this is truly a very positive experience. This was the perfect opportunity to strike up conversations with fellow ole movie fans. You’ll be pleasantly surprised to discover what bonds you can create in these lines, chatting with folks from all over the country. 30. Strategizing to get the lowest # possible for your spot in line. This process of snagging a spot as early as possible allowed for priority seating. For any screening or event that you absolutely, positively must see, the goal and bragging rights was to secure the lowest number for your position in line. This involved sometimes skipping an event in the time slot prior. Hey, this fest isn’t for amateurs! 31. The popcorn only diet. For those like myself who want to get the most bang for your buck, there is very little time for actual eating of food that comes in the form of a square meal. I was advised to bring snacks. But otherwise, the most accessible snack is popcorn at the concession stand. Where else is it acceptable to eat popcorn for breakfast, minus the good ole college days? No problems here. 32. The “Capture the Flag Movie Screening Game”… is the best exercise. Worried about that concession stand diet affecting your waistline while hob-nobbing with celebs at the TCM Fest? No worries! With the mad dash strategy involved to race to each screening or event, combined with little time to eat more than a handful of popcorn every few hours, you are in better shape than you might think. 33. 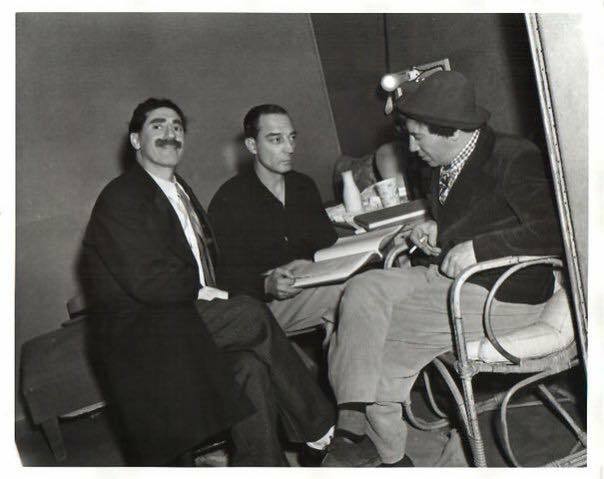 Mel Brooks Interview with Bob Osborne. 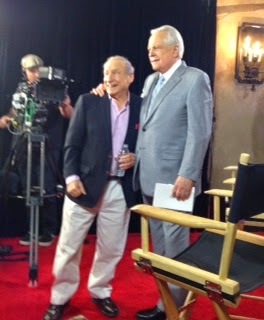 Here was my chance to see Mel Brooks up close. Earlier in the day, we got the inside scoop about this taping for a special one on one interview at the Roosevelt. There wasn’t a moment’s hesitation that this was a must-see event. Squeezing in to the front row yet off to the far side of the stage in hopes to get a better view of his face, rather than his back; we hung on to every word. He told several stories about the making of BLAZING SADDLES including what it was like to work with writer Richard Pryor and how Cleavon Little was chosen for the lead; how ERASERHEAD led him to David Lynch as his director for THE ELEPHANT MAN (1980) and a hilarious bit about meeting Cary Grant at the Commissary. He also spoke sweetly about his wife Anne Bancroft. There was a subtle yet notable pause to take a drink of water just before he spoke her name. She passed nearly nine years ago and there’s no doubt in my heart she is very much still and always with him. 35. Chicken Pot Pie at infamous, The Musso & Frank Grill. Proudly serving Hollywood since 1919, here was another Hollywood landmark that seemed untouched by the passage of time. From the waiters to the classic menu selections that appeared unchanged for decades, to my heavenly chicken pot pie, this was a special treat. Steeped rich in Hollywood history, as I looked around I could imagine the stars like Chaplin and Fairbanks as regulars dining at the softly worn leather booths or Bogie and Bacall sharing a drink at the bar. 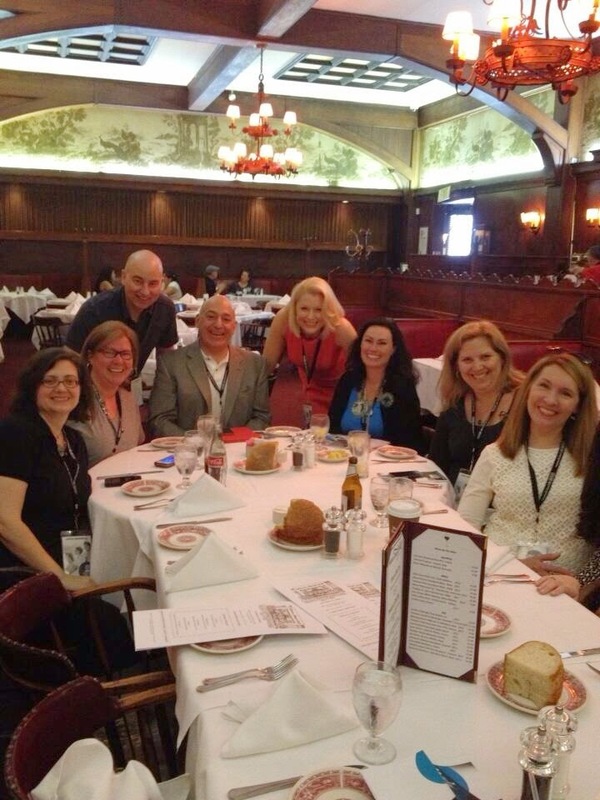 But my greatest source of enjoyment for that lunch was the company of my #TCMparty friends. 36. 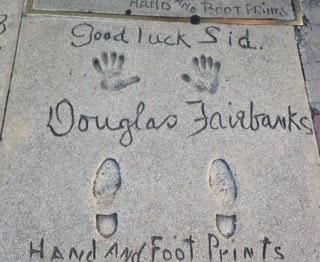 The stars on Hollywood Walk of Fame. I suppose these sidewalk stars seem hum-drum to a Hollywood or LA area resident. The most eccentric crowds of folks that were either selling or demonstrating their wares and often festooned in outrageous costumes certainly paid no attention to the famous names permanently displayed underfoot. But for me, this was yet another hallmark of Hollywood history. From the fantasy to the reality, there was much for me to take in. 37. 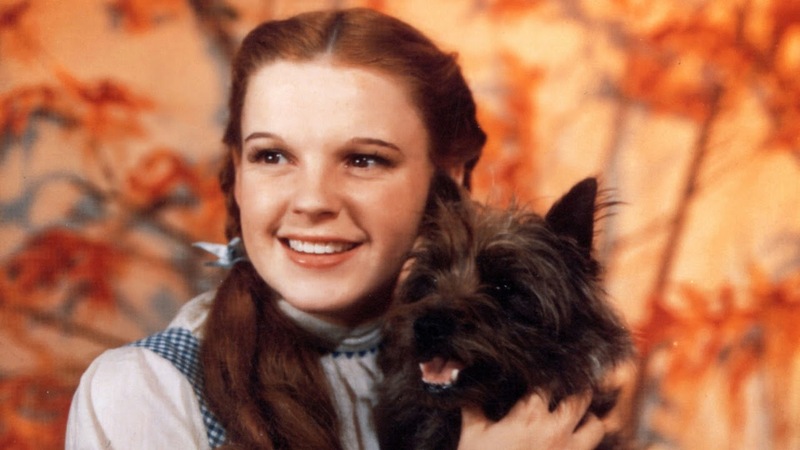 Judy Garland: A Legendary Film Career @ Club TCM. This was a wonderful presentation by award winning producer and author John Fricke of clips and intimate tales of Judy Garland. I got misty more than once. What an unparalleled talent she was. There will never be anyone else like her. 38. TCM at 20: Inspired By Classics. This was a packed house event at Club TCM, which was set up beautifully at the Roosevelt. The panel of guests reflected a sampling of the artists commissioned to create works of art to celebrate TCM’s 20th anniversary. The panel included Jane Seymour (my GAWD this woman does not age), and the legendary talent and beauty Kim Novak. 39. EL CAPITAN! The architectural details on this old movie house were phenomenal. 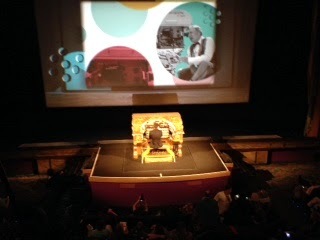 What an uniquely fun treat to watch a man skillfully playing a grand dame of a pipe organ prior to our feature. Then moments prior to our presenters, this organ, as the man continued to play to the end of his song, magically descended into the floor. Pure Hollywood magic and the show hadn’t even begun yet. 40. John Ford’s HOW GREEN WAS MY VALLEY (1941). Surprisingly, this was actually my first time seeing this Ford epic film. I had always caught parts of it but never had the pleasure to see it in it’s entirety. What an emotionally moving film. Visually speaking, it is a stunning Ford feast for the eyes to behold. Hard to believe I waited this long to see it. But I’m thrilled I got to experience it with my friends in the balcony, many who were just as choked up as me. 41. Maureen O’Hara’s introduction to HOW GREEN WAS MY VALLEY. This was the moment we had camped out in line and waited for more than an hour. My silver screen idol from my Irish American childhood was right there, in the flesh. I peered down from the balcony and could barely swallow as she appeared on stage. A highlight from her brief interview with Bob Osborne occurred as Osborne asked her what it was like working with John Ford. She raised her flat palm to the side of her mouth, looking out to the audience and mischievously responded in her distinct brogue, “I thought we were here to talk about me.” The crowd immediately with a thunderous laughter. Even at 93, this lady kept us on the edge of our seats. 42. Maureen O’Hara Interview with Bob Osborne. We were treated with yet another opportunity to see my favorite Irish lass. But this time, strategy was essential to ensure a much closer proximity to this delightful Dubliner. So Aurora of @citizenscreen, Annemarie of @classicmoviehub and I protected our territory about THREE hours early at the velvet rope in order to garner the best spot to see our beloved Ms. O’Hara. After chatting with Bob on topics such as how much she enjoyed working with Charles Laughton, it was sadly time to end the conversation. But this spitfire was not done with us just yet. Not only did she grant us the privilege of turning around so we could take photos of something other than her back, but she also welcomed a couple of questions from the audience. I stood practically at arm’s length from her. It was all too surreal for words. 43. HAT CHECK GIRL (1932). We #TCMpartiers were on board for this little PreCode gem. We were one of the lucky ones to nab a spot in this smaller venue. It was a fun lark and we enjoyed Ginger Rogers company yet again! 44. Academy Conversations: THE ADVENTURES OF ROBIN HOOD (1938). Talk about a delightful time! The entertaining pair of Craig Baron and Ben Burtt were a total hoot as they donned their Sherwood Forest feather caps and educated us on the various tricks and special effects behind the scenes of this treasured American classic. Let’s face it, spending a Sunday morning watching Errol Flynn’s snug tights in all his technicolor glory ain’t have bad. 45. The Roosevelt Poolside. Simply gorgeous. It had a distinctly old Hollywood glamor look and feel with all the modern amenities. 46. THE WIZARD OF OZ (1939) This was my final film of the festival. As we stood in line, @citizenscreen and I struck up a conversation with our line neighbors (as we do..) and as a result these charming folks were media broadcasters from ABC Radio and interviewed us with mics right on the spot! Bob Osborne himself greeted the audience to close out this final film. We then watched Dorothy and the gang in a brilliant 3D restoration, back in the majestic Grauman’s Theater exactly where it premiered in Hollywood 75 years ago. It gave “there’s no place like home” a whole new meaning. 47. Treasures of the Silver Screen. Treasures were every where I looked. From the world’s most recognizable blue gingham dress of my fellow Kansas gal Dorothy, to the original piano used in CASABLANCA which is much tinier than you’d ever imagine, classic treasures abound. I wanted to capture some of this lightning in a bottle by bringing home a souvenir to extend my memories. So I purchased some beautiful jewelry in the TCM gift shop. (And as tiny as that piano was, I don’t think it would fit as a carry on.) With many of this year’s TCMFF marketing and design themes being a nod to the 75th anniversary of THE WIZARD OF OZ, I was contemplating what item to bring home to Kansas. Then my friend Elise aka @EliseCD came to the rescue by generously donating her bag of goodies including a “Toto, I don’t think we’re in Kansas anymore” notebook with Dorothy’s profile standing in the shadow of Grauman’s and a stationary collection of the commissioned 20th anniversary art. Aurora of @citizenscreen also kindly gave her Dorothy notebook for me to pass on to my hubby. Aren’t #TCMparty friends the best?! 48. Closing Night Party! 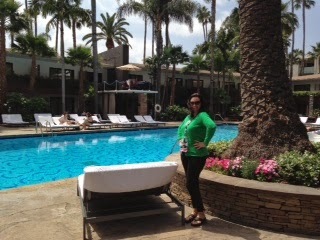 All dolled up, I joined my friends at the Club TCM then joined others poolside. Taking a few snapshots here and there, it started to sink in that this grand adventure was coming to a close. I didn’t want it to end. 50. My tearful goodbye. I didn’t want to leave this cinematic utopia. More importantly, now that I had connected with my TCM friends, I REALLY didn’t want to say goodbye. After the exchange of hugs, I hesitantly made my way into the backseat of the cab (Will aka @willmckinley and Aurora @citizenscreen insisted I not walk alone to my hotel on behalf of my protective hubby), I looked up at the two with tears welling up in my eyes and waved farewell. This was an experience of a lifetime for me. So of course I plan to do this all over again next year- but this time accompanied by my sweet husband. 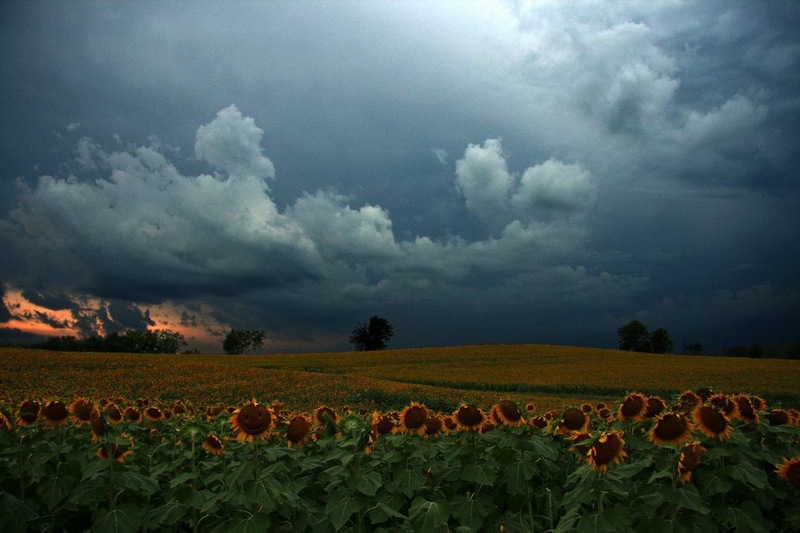 Dorothy was right, there is no place like home. Perhaps I’m lucky enough to have two homes: with my family in Kansas and wherever my Old Movie Weirdo pals shall gather.